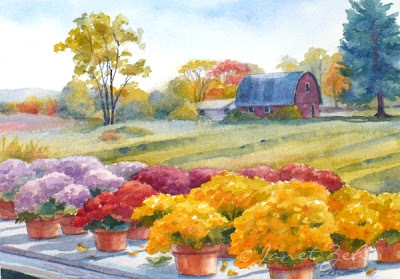 This pretty scene is from a farm stand in a nearby town. I was driving by one sparkling autumn day and the banks of colorful mums caught my eye. So I stopped and, while the crowds of people were shopping for pumpkins and flowers, I took pictures! 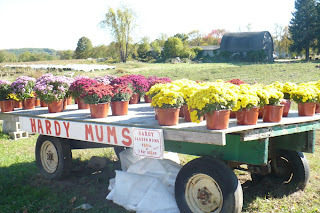 These mums were on a large cart with a red barn in the distance. 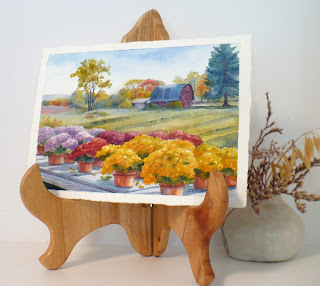 Let's take a look below at how I painted this scene. When working with a photograph, I select the parts that are the most interesting to make a composition. It is unnecessary and usually undesirable to paint everything in the photo. I was not interesting in showing the sign and the wheels on the cart. 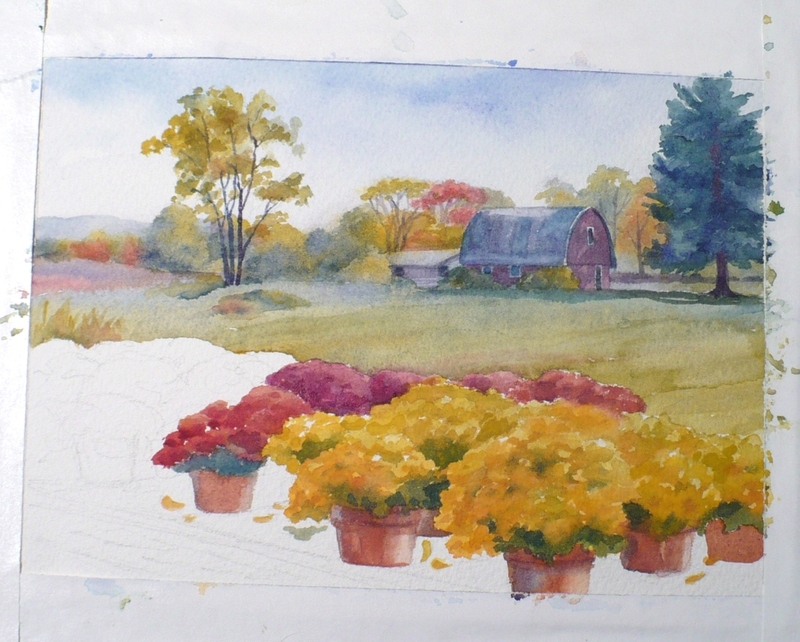 So I left those elements out of my composition in order to have the focus on the flowers and the barn in the distance. 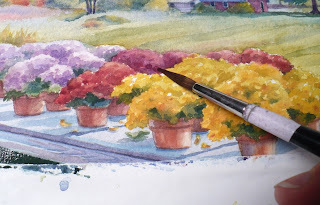 My composition is drawn on the watercolor paper. Next I paint the sky wet-into-wet and also paint a pale blue wash over everything in the distance. The blue wash cools the area. Cool colors recede, making the distant areas appear farther away. Then I paint in the colorful autumn trees and the barn in the distance. 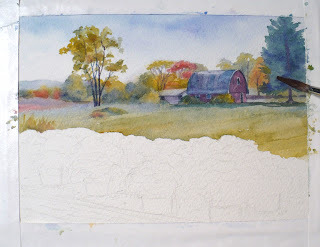 The distant trees and the field are painted wet-into-wet, meaning the paper is wet with water and colors are added allowing them to blend. The foreground pots of flowers are painted next. Details such as the cart bed and additional values in the flowers are added last. And here is the finished piece. 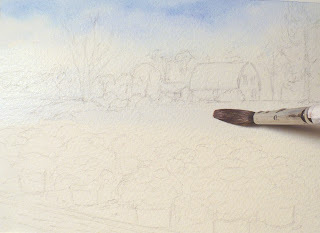 Though you may not notice that the background is more blue from the initial blue wash, it serves the purpose of allowing the colors in the foreground to pop forward giving the painting depth. I hope you enjoyed this little demonstration. "Chrysanthemums at the Farm Stand" is sold, but you can contact me to have one made just for you. Have a lovely day!